Malcolm Coles, digital director at Trinity Mirror, will discuss newsroom experiments and how to make successful trials ‘stick’ following the positive reaction to Trinity Mirror ‘spin-off’ sites UsVsTh3m, Ampp3d and Mirror Row Zed. Coles will join the BBC’s head of visual journalism, Amanda Farnsworth, and Pat Long, head of news development at the Times and Sunday Times, in the opening panel on experimenting in the newsroom. Anna Doble, assistant editor at BBC Radio 1’s Newsbeat, is another new addition to the speakers list in a session on how news organisations are harnessing the revival of audio in journalism. Having started her career in radio, Doble joined the BBC after an award-winning term as head of online at Channel 4 News, Doble is leading the revamp of the Radio 1 show on digital, mobile and social media. Analytics expert Stijn Debrouwere is the third new speaker to be announced for February’s conference and the first speaker confirmed for a session on how journalists and newsrooms can measure success in the digital age. How should journalists monitor the response to their work? And should different departments be looking at different metrics? With experience at the Guardian and the Tow Center, Debrouwere will share his opinions and experience among other speakers in this session. Other speakers from the Guardian, BuzzFeed, Sky News and more have already been announced for the conference, which focuses on practical tools and tips for digital journalism. It will cover topics including online investigations, visual storytelling, election coverage, engaging young audiences and emerging technologies as well as a keynote speech from executive editor for digital at the Guardian, Aron Pilhofer. See the other speakers already announced here, with the full agenda to follow soon. Tickets for the one day event at MSN UK headquarters in London are available now at £165 +VAT. An additional day of training is also available on the following day, Wednesday 4 February, with a choice of training courses: ‘An introduction to infographics’ with Lulu Pinney, who will also be speaking in the session on visual storytelling during the conference, and ‘social media content strategies’ with social media expert Sue Llewellyn. More information on these news:rewired+ courses is available here, and a third option will be announced soon. 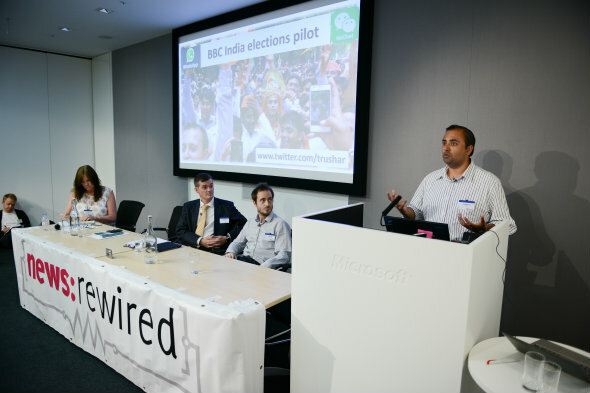 Tickets for news:rewired+, which include full admission to the sessions, lunchtime workshops and networking drinks of the conference, as well as a full day of training, are just £335 +VAT. All ticketing information is available here.